It's about to get really uncomfortable around here today. Why? Because I'm sharing what I'd consider an unpopular opinion. (Click here for my thoughts on brunch.) The subject of today's diatribe: listening to music at work. 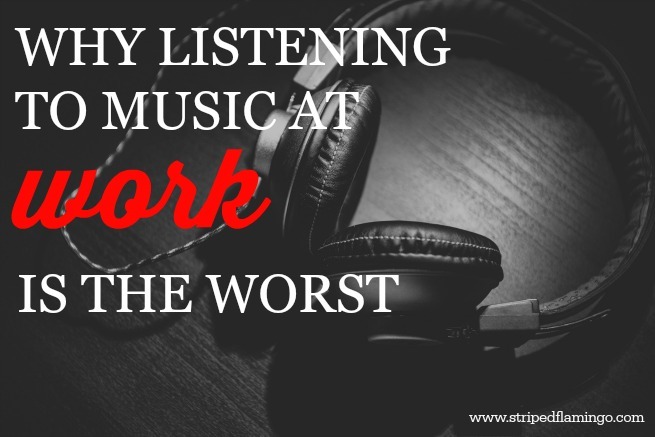 Nothing makes me angrier (well that's a lie because rule-breakers generally make my blood boil) than someone with earbuds jammed into their ears sitting at their desk working. Why? -one- This leaves you vulnerable. If you're not aware of your surroundings at all times you can't react appropriately. Say you hear a large group of people walking towards your area, or, worse, you hear some sort of panic or emergency that's occurring. By being tuned out you're leaving yourself open to surprises or even attacks. -two- It makes you look disengaged. Listen, conversation is the lifeblood of business. To form and build relationships you must have conversations. Constantly appearing that you're unwelcome to conversational advances can really wear on your coworkers. It discourages friendly camaraderie and rapport that makes working relationships...well...work. I, for one, would love to sit at my desk and listen to the Hamilton soundtrack but I can't. Why? Because the music distracts me from my work. I'd much rather harmonize with the Schuyler Sisters than send an email so I find myself absorbed into the and not into my job. Then I start to make mistakes. It's way too distracting to listen to music at work. I usually only listen to music on Friday afternoons when I'm doing brainless activities like re-sizing photos or cleaning out my email! I used to listen to my podcasts at work with one earbud so no one could sneak up on me. Now, I have a different job and have to do less mindless work so don't usually listen anymore. I kinda miss it.